There are a lot of aspects to consider when purchasing a luggage suitcase. Are you traveling locally or internationally? For how long will you be traveling? Do you intend to take the luggage piece on board? How much are you prepared to pay? There are a plethora of top suitcase brands available nowadays and each brings its own unique features to the market. Whether you’re looking for the best suitcase options for local travel or the best luggage for international travel, there is a truly wide variety of options available. This can make shopping for the best suitcases very confusing. For that reason, we’ve curated some of the best brands for luggage of all kinds for 2017 to help you pick out your next piece of quality luggage. Both of these have their upsides and their downsides. In a nutshell, soft suitcases are more practical while hard suitcases are protective and safe. Soft suitcases are often lighter in weight and easier to handle than their hard counterparts. Their soft structure allows for a variety of designs with external compartments and attachable extras that can make for more practical and easily accessible packing. It’s much easier to cram at last minute item into a soft piece of luggage than into a hard suitcase. Furthermore, they stay looking neat for longer as they are less likely to scuff than hard luggage. They’re easier to maneuver into overhead luggage bins and on trains than hard luggage which can be quite clumsy to handle. Hard suitcases, on the other hand, are very easy to clean compared to soft luggage and are more durable. They are often designed like a clamshell which allows you to pack 50% in the one side and 50% in other, with a stabilizing divider in the middle to keep all your belongings safe and secure. Apart from protecting your belongings from breakages, hard luggage will are also less easy to break into, so they are overall a better choice if you’re looking for safety. In this case, the bigger the better is not true. Remember, the golden rule of packing is that, no matter how large the suitcase, you will always find a way to fill it up. That’s just the way the world works. Some low-cost airlines have a weight limit of as low as 33 lb per piece and if you have the mothership of all suitcases, it’s very unlikely that you’ll be able to keep your luggage weight below that limit. Most airlines allow between 44 lb and 30 lb check-in luggage and 15 lb carry-on luggage per person. Good suitcase brands have three to four different sizes of suitcases ranging from large (30”x19”), medium (26”x18”), compact (25”x14”) and cabin (19”x13”). For a short trip, the best option is to try and go with cabin luggage only. This may mean that you will have to adapt your packing strategy, but it is safer and easier to have your belongings with you at all times. If you’re going on a longer trip, a medium-sized suitcase will do fine if you pack moderately and you will be more likely to stay within the airline luggage weight allowance. If you’re a heavy packer, you can compromise by buying a larger suitcase in an ultra-lightweight material such as nylon and will want to stay away from hard suitcases altogether. Before you make a commitment to buying a very large suitcase, be ultra-sure that you really do need all that space. The rest of the article will feature suitcase reviews showcasing top luggage bags. The best luggage isn’t necessarily manufactured by the most well-known luggage brands – there are many unknown gems available when looking for the best suitcases for travel. When looking for the best hard case luggage pieces it’s important to look at the look and feel of the exterior, the weight and how these best hard suitcases are constructed. One should also consider the packing capabilities of the interior. This hard suitcase from one of the best hard luggage brands, Samsonite, has divided interior compartments for organized packing. It has small pockets in the interior for stowing toiletries, accessories or delicate items. It comes with a standard retractable handle. It is made out of lightweight polycarbonate and has multi-directional spinner wheels for easy maneuverability, allowing you to push, pull or roll as you please. It has a beautiful brush-stroke coloration which is great for hiding any potential scratches or scuffs from your journeys. It has a side-mounted TSA lock for added security. It comes in 3 different sizes: 20”( 6.7lbs), 24” (9.3lbs) and 28”(11.13lbs) and in a range of four colors: charcoal, deep blue, orange and purple. This is one of the best luggage brands for men. This colorful hard suitcase for SwissGear has large interior mesh pockets for organized packing. Its clothing tie-down straps help to keep suits and shirts neat and tidy. Its aluminum push button locking telescoping handle extends and retracts effortlessly. It’s constructed out of polypropylene for extra protection of your valuables. It has eight 360-degree multi-directional spinner wheels for unsurpassed maneuverability. It has an integrated TSA approved combination lock. It comes in teal, red and white and three different sizes: 28”(10.8lbs), 24”(8.2lbs) and 20” (6.5lbs). 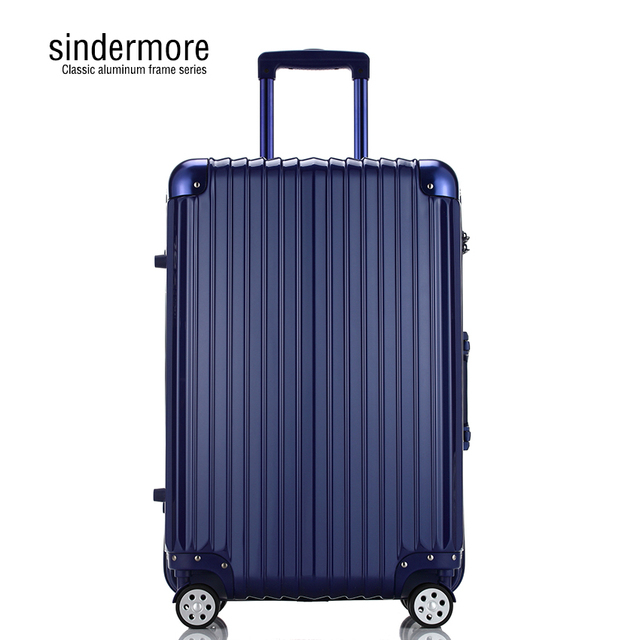 Best luggage reviews have Sindermore as one of the best suitcases for international travel. It comes in five different sizes ranging from 20” to 28” in black, silver, red, blue and gold. With eight 360 degree spinning wheels it is easy to move about and it is fitted with a TSA combination lock. Its sturdy aluminum frame makes it very durable and visually appealing. It has a water- and dust-proof seal for extra protection of your belongings. The interior features stylish mesh compartments and clothing tie-down straps for superior and organized packing. This stylish hard shell luggage case comes in a range of beautiful metallic colors: silver, champagne, and black. It’s has a front zip pocket and the interior has a high capacity for packing. The 24” check-in size weighs 11lbs which are only 4lbs short of airline check-in allowances, so the packer would have to be wary of weight restrictions when opting for this model. Its eight 360 degree spinning wheels let this suitcase hit the ground running. Its aluminum alloy handle is durable and makes for easy pushing and pulling of the suitcase. This hard suitcase has 360-degree spinning wheels supporting a magnesium-aluminum alloy case and an aluminum drawbar. It comes in four different sizes: 17” (4kg), 20” (4kg), 24” (5kg) and 28” (6kg) respectively. The exterior sports a handbag hook and a TSA approved combination lock. The interior has basic, but stylish polyester mesh compartments and clothing straps. It’s available in silver, rose-gold, titanium-gold, silver and purple. As soft luggage generally has more features than hard luggage, this is something that needs to be taken into account in luggage brand reviews. The weight is again an important factor as well as the material from which the luggage is constructed. Victorinox arguably brings the best quality suitcases to the table. Its one-touch, dual-trolley aluminum handle allows for easy mobility and recesses into the bag when not in use, helping to save space. It has an expandable design which provides up to 2” additional packing space. Hanging zippered pocket and internal mesh zippered pockets simplify organization. The adjustable exterior compression straps stabilize bulky loads. It has a top zippered exterior pocket and a vertical zippered front pocket for keeping your tickets and other items within easy reach. Tie-down straps secure your items for safe transport. It has a TSA approved luggage lock and lockable YKK zippers. It’s made out of tedeolon and Versa Tek for the main body fabric and polyester and a heat-pressed for the interior lining for durability. Rear corner guards and a TPE kick plate helps to protect the areas that are most vulnerable to damage. A removable strap allows you to secure an additional bag. It comes in an easily recognizable pine color. It’s a 25” soft suitcase that weighs 10.3 lbs. This 25” piece weighs only 9.4lbs. It has a large expandable main compartment with a fully lined interior that includes tie-down straps, a removable zippered wet bag, and a large zippered mesh pocket. It also sports exterior front zipper pockets for easy access to small items or last minute items. It has an aluminum telescoping locking handle with a padded top and side grab handles for easy lifting. It’s made from a very durable polyester fabric. Its 360-degree spinner wheels offer excellent mobility. It’s one of the best travel luggage pieces on the market and comes at an affordable price. It comes in black and dark gray. It is also available in 21” and 29” sizes. The 29” model is one of the best large suitcase options available. This model is one of the best suitcases for travel on the market. It has four multi-directional spinner wheels for easy mobility. It rolls upright so there is no weight on your arm or shoulder. It has a fully-featured interior with Wetpak™ and mesh pockets. It has a padded top and side carry-handled that provides comfort when lifting a fully-packed case. The case expands for added packing capacity. It has a large front-panel pocket for last minute items with convenient quick-stash zipper pockets for tickets and smaller items, which is especially useful in the 20” cabin luggage size. It comes in a 20”, 25” and 29” size range in black, red, blue, green and purple for easy recognition on the conveyer belt. This stylish men’s suitcase comes in 20”, 24” and 28” sizes and in a wide range of colors: khaki, blue, black and purple in washed and waterproof nylon material. It has eight spinner wheels for maximum mobility. It is fitted with a TSA approved lock. It’s a slightly heavier suitcase, with the 28” case weighing in at 14.3lbs. Heavy packers had best be wary of exceeding the airline weight allowance. It has two front zip pockets and can extend for additional packing space. It has solid handles for convenient lifting, even when packed to full capacity. The telescopic handle is made from a light, yet load bearing and shatterproof material. The interior features a laptop pocket with drawstring clothing straps. From top luggage bags manufacturer, Samsonite, comes this excellent wheeled duffel. It has a split bottom compartment which provides ample space for stowing items. It has multiple organization pockets in which to accommodate your accessories. Aside from the wheels and pull bar for pulling, it also has handles for the alternative to carry the bag. Its smooth rolling wheels make it easy to transport. It has a large U-shaped opening for simple access to packed content. It comes in a 28” size that weighs 7.3 pounds, making it an ultralight option for traveling. It is also available in a 22” cabin sized option. This great wheeled duffel design from best luggage brand, Thule, has wide mouth access for easy loading and retrieval of packed content. It has V-tubing telescoping handles which promote a smooth, steady and straight pull. Its dobby nylon construction along with a molded polypropylene panel and aluminum hardware offers a durable and water-resistant design. Its oversized wheels ensure stability and smooth transport over any terrain. Many consider Thule the best luggage brand on the market and their Crossover TCRU-122 cabin luggage piece doesn’t disappoint. It has a heat-molded, crushproof and lockable SafeZone compartment which safeguards eyewear, portable electronics, and other fragile gear. It is also removable to allow for extra cargo room. The removable trifold suiter and cinch bag help keep contents organized and separated. It’s made out of dobby nylon which makes it durable and strong. Its expandable design provides extra storage space when needed. It’s a 22” suitcase and weighs in at 9.8lbs, leaving plenty of room for packing before reaching the airline allowance for carry-on luggage. The best small suitcase for overnight business travel! It fits most laptops up to 15.6” and sports a padded sleeve to protect your laptop against accidental damage. It has a large compartment with cross clothing straps to keep your business attire in tip top shape. Made from durable polyester material, this best travel suitcase will last for a long time. It has a long telescopic pull handle and smooth gliding inline skate wheels which make it easy to transport. It easily fits into overhead luggage compartments. Looking at the best lightweight suitcase options, this is one of the best travel suitcases. It has three interior zippered mesh pockets and offers storage to accommodate any type of personal or professional travel. It has an aluminum push button locking telescopic handle for easy pushing and pulling. The 29” model is expandable by 1.5” for additional packing space and weighs 10.2 lbs. It is constructed from durable polyester and features solid color designs in black and gray with front panel silver accent zippers. It has four 360 degree multi-directional spinner wheels. It has reinforced lightweight top and side handles with an integrated bottom handle for easy lifting and carrying. In the interior, it has adjustable clothing tie-down straps. It is also available in 20” cabin luggage and a medium 24” size. The David Jones Lightweight Trolley comes in a variety of colorful print designs and at the low price of only $65 for a 24” roller suitcase. It weighs only 6.6lbs so it’s also one of the lighter suitcase options available on the market. It also comes in a cabin sized and a large sized design. The beauty lies in its simplicity. It’s fully lined interior has clothing straps but not much more. It comes with a detachable coded lock. The American Tourister Fieldbrook II is one of the best affordable luggage pieces available. Four-piece sets sell for under $100 and include a medium-sized 25” upright suitcase along with a 21” cabin luggage item. In addition, you get a duffel bag and a tote included in the price leaving you with a variety of options for all sorts of traveling opportunities. The luggage comes in a beautiful two-tone design. The upright suitcases have two front zipper compartments for last-minute stashing. It furthermore has a lightweight construction for easy portability. American Tourister is known for providing best value suitcase options. This best hard shell luggage piece sells for under a $100. It’s available in a 20”, 22” and 24” size range. It has a beautiful ridged exterior design with a quality pulling rod and a handbag hook. It is very sturdy. It further has 360-degree spinning wheels for easy mobility. This model is available in white, black, red, blue and metallic pink. For good value, this is one of the best hard case luggage pieces. It comes in 24” and 20” in size options and has a sleek and smooth exterior in yellow, brown, white, black and blue color options. The 20” option has an extended pull handle for easy pulling. The pulling handle is very sturdy and nearly unbreakable. The exterior is very durable and scratchproof. The interior is beautifully lined with mesh pockets for organized packing. It has 360-degree spinning wheels for excellent mobility. This affordable piece of luggage comes in three sizes: 20”, 24” and 28”, each of which weight 6.2lbs, 7.7lbs and 9.9lbs respectively, making it an affordable and lightweight choice. It comes in green, silver, yellow, pink, blue, purple, blue, champagne, gray and red – very easy to spot on the luggage carousel. It has a tamperproof design and combination lock. It extends up to 25% in volume, allowing for loads of extra packing space if needed. The interior sports a fun polka dot lining with clothing straps, mesh pockets as well as three additional pockets in the lining. This model is exceedingly sturdy. This fun suitcase has two interior compartments with mesh interior pockets. Its large size has ample room for clothes and travel gear. Its polycarbonate construction provides extra strength against travel damage. Its push button handle extends with one touch for easy operation. Spinner wheels offer smooth and simple movement. Its fun Darth Vader theme allows children (and adults) to show off their quirky style. The American Tourister Star Wars range also features a C3PO, general Star Wars, and R2D2 designs. These themed suitcases are also available in cabin size. These fun carry-on size hard suitcases come in a variety of Hello Kitty and Disney Princess designs. It has spinner wheels and a convenient drawbar handle for easy maneuvering. This is a perfect way for little girls to travel. Now that you’ve seen a variety of suitcase options in hard, soft, small, lightweight, duffel and novelty varieties, you are ready to pick out the best suitcase for you. Consider the way that you are most likely to travel in terms of duration and destination to help you choose. You can opt for the top of the line and very expensive suitcases if you travel often, or value options if you’re not a regular traveler. Now that the choice of suitcases has been made easier, it’s time to decide what to pack for your next journey.